With Easter happening THIS weekend, YIKES! The Los Angeles Zoo wants to invite you to the BIG BUNNY'S SPRING FLING! The Los Angeles Zoo celebrates the season with three days of "EGG-citing" adventures on Friday, March 25th- March 27th from 10am to 4pm. Fun for the whole family, there are pet bunnies to snuggle, photo ops with the BIG BUNNY, and enjoy the zoos many occupants as they unwrap paper mache eggs and baskets full of treats. There will also be face-painting, bunny ear crafts, egg coloring, live entertainment by Kiddle Karoo's Easter Show, costumed bunny and fairy characters and a strolling stilt walker! Adding to the excitement is a "Big Bunny's EGG-cellent Adventure" search with clues and a special treat provided by 99 Cents Only Stores awaiting youngsters at each stop. 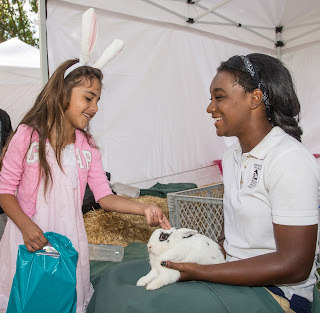 Rounding out the activities is an “EGG-ucation Station” with scent containers to give inquisitive guests a chance to see what it’s like to have a bunny's sense of smell, how to use your hands like a bunny's paws, and how to identify a bunny's emotions by the movement of its ears. All events are free with paid Zoo admission, except “Big Bunny” photos, which are available for a nominal fee. Other activities at the L.A. Zoo include close-up animal encounters at 10:45 and 11 am, with an extra encounter at 12:45 pm on weekend days, and shows and presentations such as the ELEPHANTS OF ASIA training demonstration at 11 am; the popular WORLD OF BIRDS SHOW at 11:30 am; a HAWK TRAINING DEMONSTRATION at 2 pm (Saturday/Sunday only); a MARSUPIAL TALK at 11:30 am (Sunday only); and more. The schedule, subject to weather and other changes, is available at the Zoo entrance and online at www.LAZoo.org. The Los Angeles Zoo is $20 for general admission (ages 13 to 61); $17 for seniors (ages 62+), and $15 for children (ages 2 to 12). No ticket is required for children under 2. Admission for Greater Los Angeles Zoo Association members is free.